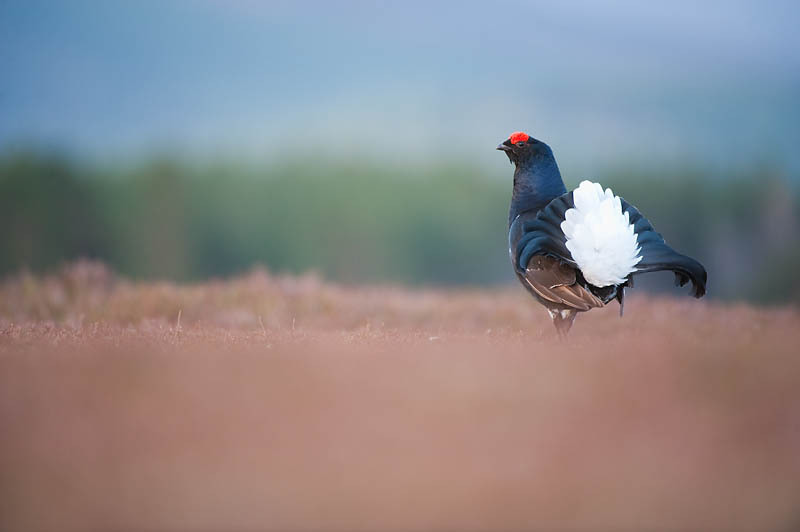 This morning I got up at the unearthly hour of 3.00am setting off under a setting half moon across the Grampian mountains to a windswept patch of moorland where I hoped to witness one of the spectacles of the birding world – male blackcock strutting their stuff in an attempt to impress the ladies. 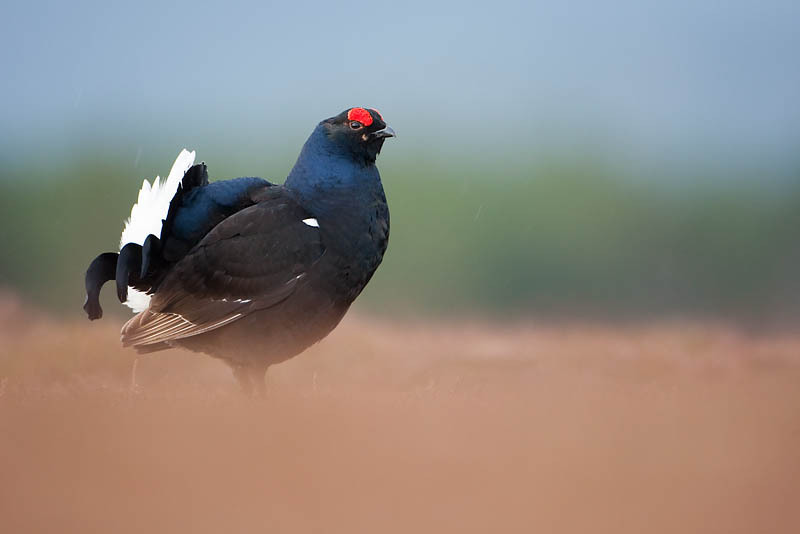 The display ground or lek is a traditional area of open moorland that has been used by generations of male blackcock. Some leks can be of more than 30 males but the one I’m working is around 8 birds which is a fairly typical number. The moorland track was running with water from recent snowmelt and is was a slippery climb up onto the lek carrying two rucksacks – one with my tent hide, sleeping bag and two tripods the other with two telephoto lenses and camera bodies – and a flask of coffee to keep me awake! I soon found the lek site with the aid of my head torch and set about erecting my tent which I use as hide for the blackcock as it provides a good low viewpoint, plus I can get into my sleeping bag and catch forty winks whilst I’m waiting for the birds to arrive. With the tent erected I piled everything inside and pinned a camouflage netting across the tent opening and set up the tripods one for my 300 f2.8 lens the other for a 200-400mm thereby giving me some options for compositions. Cue mini-disaster – I had forgotten to put the tripod plate back on the 200-400mm lens so there was no way I could attach it to the tripod head! I manged to kind of balance it and then tried to tie in on with some cord I had with me. Not ideal and not exactly rock solid but it might just work! It was just getting light when the first bird dropped in but it was nervous. I could several other birds lingering around further back and expected them to gather together in the main arena of the lek. It was a couple of weeks earlier than when I did them last year and maybe they weren’t in ‘full leking mode’. I was worried that maybe the hide was putting them off and this may have been the case but again last year and on every other occasion I have photographed blackcock, they have never shown any signs of unease about the hide. It was also quite windy and I know this does sometimes make them nervous or alternatively there may have been a raptor around that was spooking them. A few birds eventually came onto the lek but didn’t display very much and soon departed for the pine trees lower down the hill. It had been a largely fruitless morning in terms of photography but I had learnt something more of their behaviour and also not to take anything for granted . As I packed up I spotted four mountain hares eyeing me suspiciously in the bright sunshine that was now breaking over the nearby hillside. I left them to it and turned by attention to red grouse which turned out to be more obliging and photographable from the comfort of my vehicle. Not in the same league as their close relatives for excitement and entertainment but enjoyable nevertheless. This entry was posted in In the field and tagged black grouse, blackcock, hide, lek, photography, red grouse. Bookmark the permalink. 3 Responses to Grousing around! Nice story, Mark. I can sympathise with your sinking feeling regarding the plate. Infact, I am sure most of us can. I had a similar ‘disaster’ 2 years ago when working on buzzards here in Kent. I entered the hide pre-dawn only to find I had the right tripod head, wrong plate! So a 1/4m run back to the car down an icy lane was in order. Nothing like sitting in a freezing hide, sweating and panting! Worth it though as the birds turned up a few hours later. Brilliance for free; your parents must be a seetwhaert and a certified genius.